The easiest criticism of modern western comics is also the truest; that nothing ever changes. Bruce Wayne’s parents always bleed out in an alleyway. Peter Parker never catches a break. The Joker always escapes. The resets button is always pressed. The next issue is always a relaunch. The Life of Captain Marvel is a relaunch. That’s the last time it follows any of these rules. This is a book about two sides of the same woman, presented by two different art teams. Marguerite Sauvage’s expressive, deceptively gentle pencils tell the story of Carol Danvers’ abusive childhood. Carlos Pacheco, Rafael Fonteriz and Marcia Menyz chronicle the events iin the present day that lead her back to her past and everything that flows from it. Sauvage’s work is expressive, lively and full of the ugly emotion of childhood. Pacheco’s work is all clean lines and speed, and struggles visibly and necessarily against Carol’s grounding of herself. It’s a complex and knotty artistic approach to a complex and knotty book. 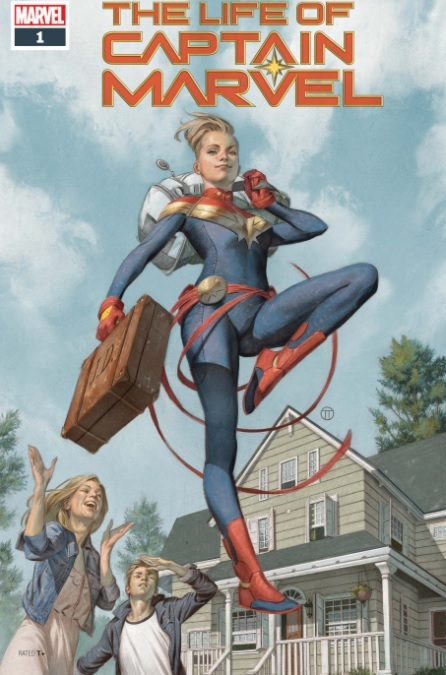 Margaret Stohl’s plot takes Carol Danvers, little sister of a broken family and Carol Danvers, Captain Marvel, and shows how they’re related by tearing them apart. Previous modern runs on the character, Kelly Sue DeConnick’s iconic work especially, have set Carol up as a pragmatic, stoical powerhouse. She’s Princess Sparklefists, an incredibly powerful superhuman who is painfully aware of her limitations and works around them from a position of strength. After all, canonically Danvers is a former test pilot and Air Force Colonel as well as one of the most powerful super-humans on the planet. She’s got a cool cat too. Stohl denies her that certainty in the smartest possible way; by having her cook off just a little. On an Avengers op on Father’s Day Carol loses it, just a little, and beats a pair of villains within an inch of their lives. The unspoken social contract that binds hero and opponent together is broken, she knows it and she does the one thing that every good test pilot knows; level out, ditch if she can eject if she can’t and figure out what went wrong from the ground. But the ground isn’t steady. The ground is a dead father, a mother who won’t look the abuse he handed their family in the eye and a brother who’s furious at her for leaving. Carol’s home life is untidy and jagged and only made worse when her brother almost dies in a car accident. Consumed with guilt, Carol takes a leave of absence. And in doing so, discovers that her past and her present are much more connected than she thought. Margaret Stohl has been writing Carol for two years and it shows. Princess Sparklefists is very much still there but she’s tempered, the brassy fighter jock replaced by a woman not entirely comfortable in her own skin, family or town. That means some elements of the book are as jagged as her home life but again, that’s on purpose. Carol’s friendship with Tony Stark, at first, plays as a little odd given their past antagonism. But as the book goes on and you see Tony’s cheerful, brutal honesty at his own mistakes, it shakes out into a sibling dynamic that’s really sweet. Tony is the big brother from Sing Street, a cheerful burnout who is passionately concerned with making sure his little sister doesn’t go the same route. Carol is cautious, hyper aware and worried she’s going to screw up anyway. The way they orbit each other is fascinating, realistic and familiar. The book’s other jagged edges smooth out too. Carol’s family dynamic (And glorious accent shift!) bed in by the end of the first act and there’s a welcome sense of Americana that only Steve Rogers has really touched on before. Carol really is a small town girl made good and the book lets set to explore the price she’s paid for that in some brave and clever ways. Even Princess Sparklefists has to come from somewhere. Then there’s the ending, which suggests, strongly, that Carol’s abusive father is directly connected to the events of her adult life. I have no idea if that will work. I do know it’s a central pillar of the book and the reveals on where that plot is going look to already be on the way. And most of all, I know if any writer can pull this off, it’s Stohl. Carol Danvers may be grounded for now but like any test pilot she’s only as good as her support. And based on this issue, Princess Sparklefists has one of the best ground teams in the game.